Born June 2, 1932, in Chicago, to Greek immigrants Peter and Bessie (Stamos) Skizas, young Lou struggled in school in his early years because of a lack of familiarity with English. “We lived in the vicinity of Polk and Kedzie, the only Greek family on the block,” Skizas told Bill Gleason. “We spoke Greek in my home, and the first day I went off to school, the teacher sent me home. I couldn’t understand her so she thought I was retarded.” 3 Skizas eventually graduated in 1948 from Crane Tech in Chicago, where he excelled in baseball. John Kringas, a businessman who sponsored teams for young athletes in the Chicago area, told the Chicago News Journal in 1976 about Skizas’s start in major-league baseball. “Our team was playing in Riis Park and a scout came out to look at the opposing pitcher, who was a tall and highly regarded right-hander,” Kringas said. “Skizas, only 16 at the time, blasted out four hits against the highly regarded hurler and right then and there got the recognition that led to a professional career.”4 After signing a contract with the New York Yankees in 1949, Skizas began his professional baseball career as a third baseman for Fond du Lac of the Class-D Wisconsin State League. He finished the season with Independence of the Kansas-Oklahoma-Missouri (KOM) League. With Independence, Skizas batted .297 in 102 games, driving in 76 runs. The following year, Skizas was moved up to the Class-B Piedmont League, where he played for the Norfolk Tars. Making his debut on April 29, 1951, Lou hit two home runs and three singles, driving in five runs. A month and a half later, on June 16, he had another impressive performance for Norfolk, hitting three home runs and driving in seven runs against Richmond. Hitting .311 for the season, Skizas helped lead Norfolk to the Piedmont League championship. After spending 1952 and 1953 in the Army, serving overseas in Germany and Italy, Skizas began the 1954 season with the American Association Kansas City Blues. Sent down to the Southern Association Birmingham Barons in late May, Skizas made an impressive debut with the Barons, racking up five hits in seven at-bats during a May 30 doubleheader. His unique batting style entertained the fans, reported sportswriter George K. Leonard: “When he appeared in Nashville’s Sulphur Dell for the first time, June 1, Skizas entertained a crowd of 2,847 with his sideshow shuffling and arm waving. After going through a long ritual before each pitch, Lou stuffed his hand in his back pocket as a good luck gesture just before swinging. Occasionally that gimmick backfired when the opposing pitcher quick pitched.”6 Skizas batted .305 during his 69 games in Birmingham. 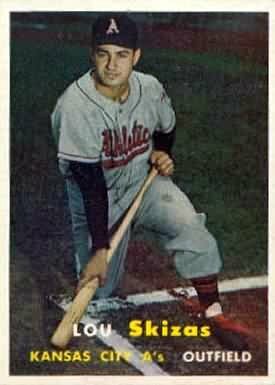 Moving up to the Yankees’ American Association team in Denver in 1955, Skizas had a good, albeit injury-plagued, season. Sidelined for two weeks after catching a fly ball on the top of his ring finger, Skizas was leading the league in hitting with a .353 average by early August. But a groin injury on August 6 kept him out of the lineup for 10 days. Shortly after returning to the lineup, Lou was ordered to “bed rest” on August 28. Finishing the season with a .348 average, Skizas was 24 at-bats short of the 400 needed to put him in the running for the league’s batting championship. He ended the season with 21 home runs and 99 RBIs. Starting his major-league career with the Yankees in April 1956, Skizas made an impression on manager Casey Stengel. Not only did his manager call him “the greatest natural-looking hitter I’ve ever seen,” he added that “he can hit any pitcher who ever lived.”8 But though impressed with Skizas’s hitting skills, he was less impressed with the player’s fielding ability, and Skizas made only six pinch-hit appearances with the Yankees, managing just one hit, before being sent down to the Yankees’ Triple-A team in Richmond. Again he spent most of the season playing right field, though he did see some games at left field (the position he preferred) and third base. His average dropped dramatically. In 119 games, Skizas batted just .245. On November 20, he was traded to the Detroit Tigers in a 13-player deal. Playing in left field and at third base, Skizas’s place with the Tigers did not appear to be secure early in the season. Skizas was hitting just.242 in just 23 games, and his defensive play may have made up manager Jack Tighe’s mind. “Tighe didn’t think I could do anything for that matter,” Skizas told Charleston Gazette reporter A.L. Hardman. “He not only thought I was a terrible third baseman but not a very good outfielder.”12 Skizas and pitcher Bob Shaw were sent to the Tigers’ Triple-A team in Charleston on June 5. Skizas, who had been attending college courses in the offseason for many years, did not report to Charleston until nearly two weeks after he was assigned there. “There comes a time when a man must reevaluate things,” he told A.L. Hardman. “That’s what I’ve been doing. It wasn’t that I minded playing in Charleston. But I wondered if being sent back to the minors again didn’t signify that I might be failing in baseball. I wanted some time to think it over.”13 He belted out three hits in his first game with Charleston, on June 17, but then struggled, hitting just .163 in his 28 games there. Sent down to the Double-A Birmingham Barons in late July, Lou pulled a leg muscle and a tendon in his second game with the Barons, on August 5, and was out for the rest of the season. Skizas’s tenure with the pennant-winning White Sox was brief. In just 13 at-bats in April, he had only one hit, a single against his former team, the Yankees, on April 30. The next day, Skizas and pitcher Don Rudolph were traded to the Cincinnati Reds for outfielder Del Ennis. The Reds immediately sent Skizas to the International League Havana Sugar Kings. Skizas, still only 27, never played in the major leagues again. Skizas played 36 games in Havana in 1959, batting .286, but didn’t enjoy playing there. Reportedly suffering a “digestive ailment” from eating Cuban food, he asked to be sent to a team in the United States and was sold to the Seattle Rainiers of the Class-AAA Pacific Coast League. Skizas played with Seattle through part of 1960 before being sent down to the Nashville Vols of the Double-A Southern Association. He saw action in the next two seasons with Indianapolis, Macon, Denver, and finally the Mexico City Tigers before ending his playing career in 1962. Continuing his education had always been a priority for Skizas. “My parents stressed the importance of education and my older brother, Gus [who earned a master’s degree in math], motivated me toward college,” he told Bill Gleason. “Gus was an outstanding shortstop for the University of Illinois but four years in the Marine Corps put an end to his dream of being a big leaguer.” (Gus spent part of the 1950 seasons with Vincennes, Indiana, of the Class D Mississippi-Ohio Valley League.) Lou obtained his bachelor’s degree in 1960, a master’s in 1962, and a Ph.D. in biology in 1965. “Counting two years of winter ball and two years in the Army, it took me 11 years to get my bachelor’s degree. I’d always start the semester about two weeks late and have to leave in the late winter but I was determined to stay with it,” he said.15 The man who had been labeled “not a thinker” by a baseball scout was now a Ph.D., a rarity for a professional ballplayer. An earlier version of this biography originally appeared in SABR's "Go-Go To Glory: The 1959 Chicago White Sox" (ACTA, 2009), edited by Don Zminda. Falkner, David. The Last Hero The Life of Mickey Mantle (New York: Simon & Schuster, 1995). Haraway, Frank. “Skizas, Bears’ Fidgety Slugger, Gives Flingers Fits With His Hits; ‘Nervous Greek’ Bids for Loop Batting Title and RBI Crown,” The Sporting News, August 24, 1955: 29. Hudson, Jim. “Skizas Locates Friends In Hurry With Three Hits; Davie Pitches Tonight After Sens Slam 17 Hits,” Charleston Daily Mail (West Virginia), June 18, 1958: 12. Hudson, Jim. “Warming Up; Skizas Wins Some Fans In a Hurry,” Charleston Daily Mail (West Virginia), June 18, 1958: 12. “Lou Skizas Back With Denver,” The Sporting News, June 30, 1962: 32. “Lou Skizas In Flashy Debut,” The Sporting News, May 9, 1951: 32. “Yankees Recall Siebern, Deal Robinson and Skizas to A’s,” The Sporting News, June 20, 1956: 9. 1 Bill Gleason, “Triglycerides Replace Baseball in Skizas’ Life,” undated article found in Skizas’ player file at the National Baseball Hall of Fame, Cooperstown, New York. 2 Milton Richman, United Press, “Greatest Hitter In Baseball Is Skizas,” Huronite and Daily Plainsman (South Dakota), April 4, 1957: 10. 4 Nails Florio, “Ex-area athlete Kringas Hellenic ‘Man of Year’,” Chicago News Journal, February 26, 1976: Sec. 11, 1. 5 Scouting report from Lou Skizas file, National Baseball Hall of Fame. 6 George Leonard, “Chattanooga Joins 1st-Division Battle,” The Sporting News, August 13, 1958: 39. 7 Dan Daniel, “Shortstop, Outfielder, ‘Solid Pitcher’ Listed,” The Sporting News, October 12, 1955: 7. 9 The Sporting News, June 6, 1956: 32. 10 Joe McGuff, “Skizas Is 18th Player To Sign,” Kansas City Star, January 30, 1957: 28. 11 Ernest Mehl, “A’s Skizas Doesn’t Fear Jinx; He’s Naturally Unpredictable,” The Sporting News, March 6, 1957: 34. 12 A.L. Hardman, “Lou Took Some Time To Think Things Out,” Charleston Gazette (West Virginia), June 19, 1958: 20. 14 Edgar Munzel, “Golden Greek Skizas Seen as Green Touch in Pale Hose Garden,” The Sporting News,December 10, 1958: 19. 16 Diamantis Zervos, Baseball’s Golden Greeks (Canton: Aegean Books International, 1998), 180.